Hate holding your phone to your ear for such long calls? Well there are earphones for that but don’t you hate fumbling with earphone wires that keep getting entangled? There is a Bluetooth earpiece for that. But why carry something extra all the time? 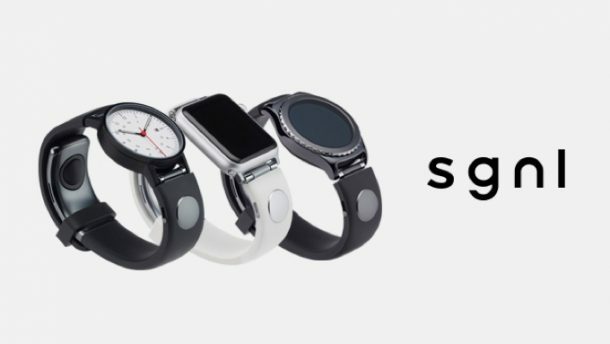 Sgnl is a wristband that allows you to keep your phone in your pocket and just raise your hand to answer a phone call. The band has a microphone built in. You place your finger to your ear, your finger transmits the sound and blocks the background noise. Wear a wristband or simply replace the strap of your watch and you have your phone on your finger. The project comes from Innomdle Lab, a startup out of Samsung. The kickstarter campaign of sgnl has achieved 30 times its goal. Each Sgnl unit is selling for $139. This one is not just an idea in the making, it actually works. Watch people getting amazed by it. A simple cool watch strap that saves you the hassle of carrying an extra gadget. While it may sound like a completely unnecessary thing to some people, it is definitely a cool thing. The kickstarter campaign is still live and the backers will get their bands shipped in February.